DUBAI GEM wishes Neel Laxmisan (Year 9E) the very best as he is selected to play for the Al Ahli UIS team under 15. Riyan is a student of year 3-C and is passionate about badminton. He has participated in many ranking tournaments from a very young age and has won the Under 9 championship in Boys Singles category in all of them. He was recently selected for IDBI Federal Quest for Excellence # Young Champs Program which gave him the golden opportunity to train under Mr Pullela Gopichand Indian National Coach for Badminton. He plays the sport for the love of the game rather than winning. Congratulations Arya Sandeep (Year 11 B) for achieving a distinction in Grade 7 (Ballet) & Intermediate (Ballet) and for achieving the highest mark of 94/100 in the Grade 7 examination. Zahra Afzal from Year 3B is very compassionate towards the Environment and this is what drove her to create this notebook out of plastic Bags. It saves paper, is waterproof, untearable, reusable and eco friendly. Devika Malhan a student of grade 6-A enjoys playing badminton and recently won the India Club Internal tournament in Girls Singles (under 13) category. Devika also enjoys swimming and has won medals for the same as well. 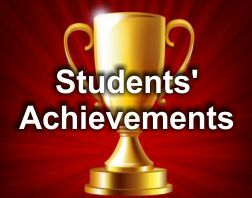 We Congratulate all our students for their outstanding achievements. They have made us proud of their success.